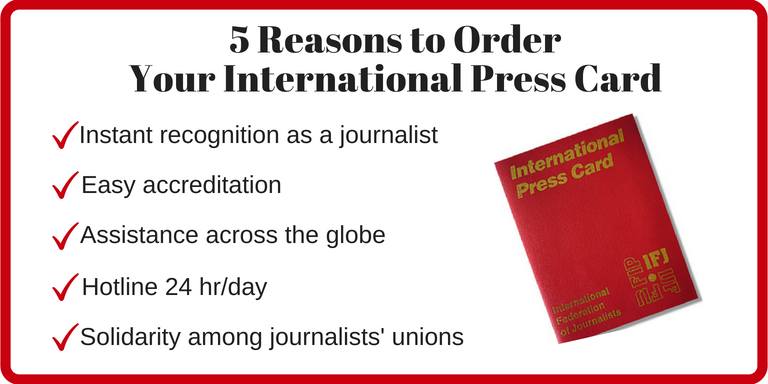 As a new benefit to our members, the Authors Guild now offers two-year IFJ International Press Cards. Press Cards provide working journalists with an instant form of identification as a professional journalist committed to ethical standards and solidarity between media professionals. Membership offers card holders numerous benefits. Why get a press card? Instantly Recognizable Professional Identification: The International Press Card (IPC) is recognized all over the world and is the only press pass endorsed by national journalists’ groups in more than 130 countries. Launched at the IFJ World Congress in Dijon in 1927, it provides instant confirmation in the United States and abroad that the bearer is a professional journalist. It is only issued to genuine journalists who are committed to the IFJ’s Declaration of Principles on the Conduct of Journalists, the world’s most recognizable set of principles and standards for the conduct of journalism. Community and Support: The IFJ provides services to press card holders, including access to the International Freedom of Expression Exchange (IFEX) network, a coalition of journalist groups that monitors the state of press freedom around the world. Regular bulletins from the IFJ and updates on actions in defense of journalists are also available to all card holders. Global IFJ Assistance: When travelling, cardholders can rely on the IFJ network to provide assistance. In most countries, the support and recognition provided to national journalists will be available to IPC holders. The IFJ provides assistance to journalists traveling in conflict zones, helping many of them get out of tricky situations in dealing with soldiers, police, or officials. Open Doors: Card holders can take advantage of the IFJ’s official status within the EU and United Nations to facilitate access to official meetings. In many countries, your International Press Card can also help you gain access to closed media events. You must be a professional member of the Guild in good standing. You must commit to Guild membership for the duration of the card (two years). You must have written at least three articles published in the past three years. Two-year Guild membership commitment: If you are paid up for the current year, you will be asked to pay an additional year to cover the timeframe of the card ($135). If you are not paid up for the current year, you will be asked to pay your current year as well as an additional year to cover the timeframe for the card ($270). Once your application is approved, you will receive a notice for your total cost. You may submit credit card information over the phone or mail in a check, payable to the Authors Guild. Please allow up to four weeks for the processing of your application and receipt of your press card. Members, please log into your online account to submit your application. You must have written at least three articles published in the past three years. Print and online articles are both acceptable, but articles should be written for a publication not owned by you.